Two Gilroy Elks chefs work their shrimp scampi food booth at the 2015 annual Mushroom Mardi Gras festival. Music and mushrooms will provide plenty of fun under the sun in downtown Morgan Hill this Memorial Day Weekend. 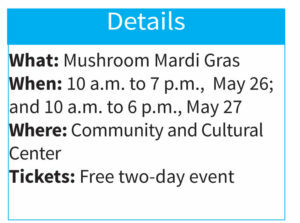 The South Valley kicks off its summer family-friendly festival season with the 39th Annual Mushroom Mardi Gras held May 26 and 27. Back by popular demand, the Mardi Gras will open its premium wine-tasting event in the rose garden at the Community and Cultural Center. It was launched last year and proved a huge success, said the festival’s executive director Sunday Minnich. It’s $25 for advance tickets and $30 at the door for 10 tastings of award-winning wines from four local wineries — Martin Ranch, Fernwood, Guglielmo and Aver Family. The wine-drinking guests will be entertained with background music on Saturday afternoon, she said. Lively dance music draws the crowds to the Mushroom Mardi Gras every year. Playing at the Downtown Amphitheater stage, the 2018 festival includes headliners Faithfully, a Journey tribute band playing at 6 p.m. on Saturday, and Caravanserai, a Santana tribute band starting Sunday at 4 p.m. See Mark Fenichel’s “Music in the Air” column on page 4 to see the full schedule. Plenty of entertainment for children will also be found through the Mardi Gras. Strolling for photo ops will be “Elsa” and “Anna” from the Disney movie “Frozen,” and “Woody” and “Jessie” from the Pixar “Toy Story” animated films. And, of course, the most fun fungi in the galaxy, “Mardi the Mushroom,” will pose for pictures. Inspired in part by the Gilroy Garlic Festival (which celebrates its 40th year in July) and the Dickens Christmas Fair, the Mushroom Mardi Gras was started by local fire chief Brad Spencer to raise funds for the fire department. Morgan Hill billed itself years ago as the “Mushroom Capital of the World” because of its several fungi-growing facilities. The festival soon evolved into an event to raise money for scholarships for local students. Fifty-five high school seniors will line up at the amphitheater Sunday at 1:30 p.m. for the annual ceremony. Of course, food is always the main feature at the Mushroom Mardi Gras. Every year, the Gilroy Elks Club members make mouths water with preparing their delicious shrimp scampi that provides photo ops for flame-ups. Foodies also come to the offerings at the Food Vendor Court. This year’s new offering brings in Mr. Pickles serving meatball and pulled-pork sandwiches, Maya Catering dishing out lobster, crab and shrimp rolls, as well as lobster bisque fries and seafood mac and cheese, and Spice It Up Catering offering rotisserie steak and chicken sandwiches as well as artichoke and hummus. For those with a sweet tooth, soft-serve ice cream and root beer floats will also launch this year. What’s sure to be a wild and weird topic of conversation of guests at this year’s festival are Dragon-breath Desserts, a crazy culinary concoction that might have come out of a mad scientist’s laboratory. The trend has grown in state fairs throughout America. More than 300 arts and crafts vendors will be on hand to show off their wares. New this year are wine-barrel dog beds. Other hand-crafted items include leather works, metal garden art, and specialty jewelry. Cooking demonstration stage chefs include “The Untamed Chef” Albert Hernandez, the Sakabozzo team of Gilroy’s Gene Sakahara and Sam Bozzo, and Patti’s Perfect Pantry’s Patti Tartaglia. Morgan Hill Life will sponsor the Mushroom Mayhem Kids’ Cooking Contest at 11:30 a.m., Saturday. Back this year after a two-year hiatus is the Mushroom Mardi Gras Fun Run that starts 7 a.m. Sunday. A special handicap accessible shuttle will take people from a parking lot at the corner of San Pedro Avenue and Church Avenue. Parking at that location is a $10 donation to the Sobrato Band Boosters. The Mushroom Mardi Gras does not charge a gate fee, so it serves as an attractive entertainment option for families and people on a budget. The festival makes its funds for student scholarships through sponsorships and the vendors. Schools also make money by having volunteers sell wine and beer and non-alcoholic drinks at various tents. Devon Spencer, a Mushroom Mardi Gras organizer and son of the festival’s founder, said he can’t think of a better way to begin this summer than enjoying good food and fun downtown May 26 and 27.